Although our main garden is now out at the farm in Langley,B.C., Brent and I also love our centrally located Vancouver condo. It literally overhangs Van Dusen Botanical Gardens , separated only by a lake. The all-concrete building is very 70′s, with ridiculous amounts of space .We have two decks, one is 20′ x 20′ and is shown in these pictures. Every year, I like to experiment with colour, but not using flowers. 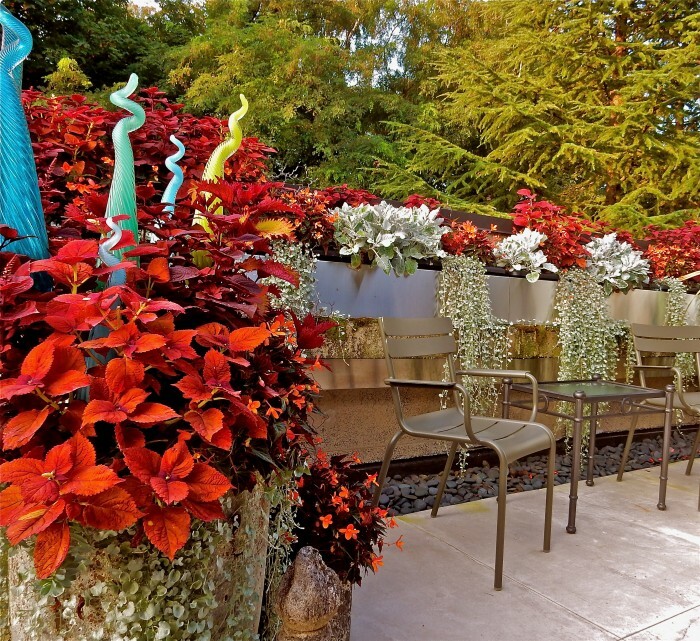 Coleus steal the show (as usual) and are fed monthly with 20-20-20 dissolved in water and applied liberally. The orange Coleus is ‘Sedona’ , my favourite of them all. I don’t know the name of the reddish one with the toothed leaf edges. 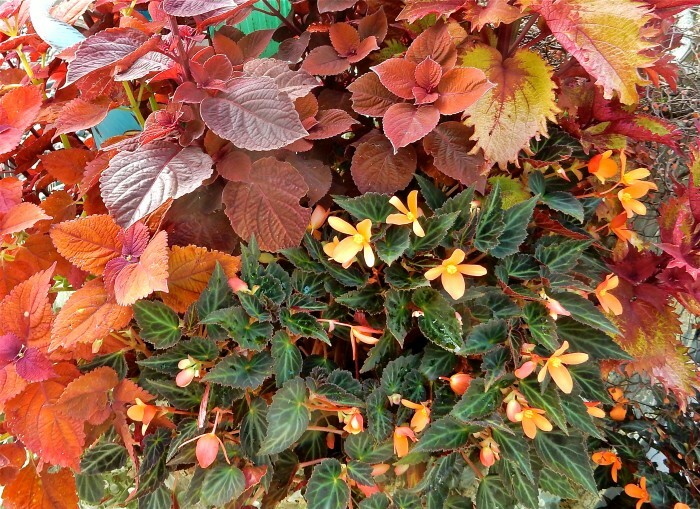 I am nuts about the small orange-flowered begonia. It is called ‘Sparks Will Fly’ and was new in 2013. It has silver-veined foliage and lots of tangerine blooms. This deck receives full sun all day long. It is also on the roof of the building and is very hot. The plants love it as long as I remember to water (by hand) every two days. The glass ‘icicles’ light up at night. They are available in many colours, and are $150.00 each with a 12 volt lamp inside, or $99.00 unlit. 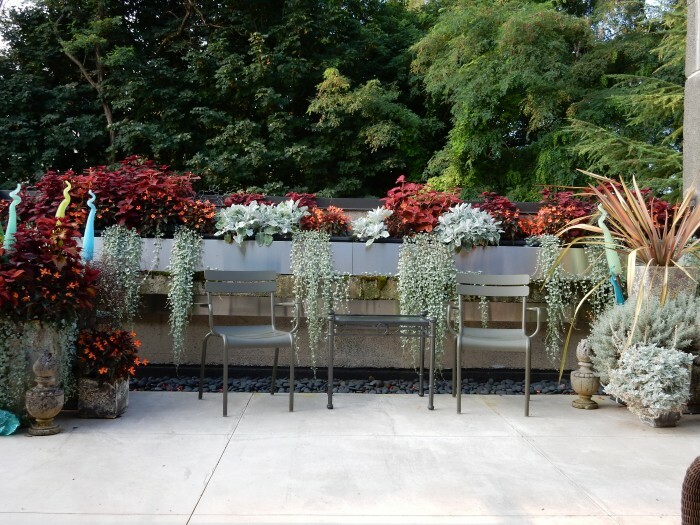 The silver trailing plant in this urn and in my long planter is Dichondra. This is a must-have annual- I couldn’t garden without it. My chairs are by Fermob, the famous French patio furniture company. This model is called ‘Luxembourg’, and available at Southlands Nursery. I love the large-leaved ‘Dusty Miller’ variety ‘Cirrus’, with its bolder, simpler white leaves. It lives through the winters here. I cut it back hard, to encourage fresh, clean growth. It breaks up all the orange with sharp, contrasting blocks of white. The evergreens in the background are in Van Dusen Gardens.